loomed large in the visit. senator in the 91st Congress. 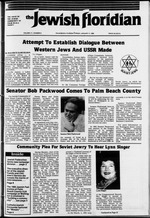 the plight of Soviet Jewry." are being denied an education. this way," stated Dr. Lorber. at the Federation's additional office 655-7706. "We look forward to Mr.
need our help," stated Mrs.
Women who have joined tK. Also serving on the commit. tee are Sheila Engelstein, prt. Sunday, January 20,10 a.m. to 12 p.m. Call 833-8422 for more information. Irough the influx of retirees. dition, in response to U.S.
Israel Expected To Approve U.S.
also have a significant impact. Combined Jewish Appeal-Jewish Federation of Palm Beach County. Inc Officers: President. such laws enacted in 1985.
foreign aid package in 1985. Women's American ORT Okeechobee cake sale. Jewish Federation Leadership Development 8 p.m.
lewish Community Center Israeli Folklore Ensemble. Congregation Anshei Shalom Men's Cub 9:30 a.m.
University Women Lake Worth study group 9:30 a.m.
Jewish Federation Soviet Jewry Meeting -12:30 p.m.
Hotel noon B'nai B'rith Women Chai 7:30 p.m.
University Women Lake Worth board 9:30 a.m.
ation Catholic-Jewish Dialogue 7:30 p.m.
Jewish Women Okeechobee Unit 12:30 p.m.
p.m. Women's American ORT evening board 8 p.m.
manent feature of African life. cash for services in Israel. of B'nai B'rith and NBC-TV. called by its right name." Seven chapels in Dade, Broward and Palm Beach counties. Serving the New York Metropolitan area. PLAN insurance funded prearranged funeral program. Israel: R?u Cross ,;->:ce. u. r.os: a r:;i*. :i>: a: ~i~ ? 3;:r \x:>:. ST. NE If A%e -. 3o^:;r Bcac". -"
of Masai Da* d Man u nat Peer* I bratL" The R m.
N:-i- ire : V-.-.erw- ^i 'A Pc--"
Mot. :- .- : V:'i-- Nfc "-* 'uns. \ arc :r ~ --;;:' i <.-:.-; ? r-; .-. ;.- -r.
.';* ?- *j- if: *i -ij' >.-" t: \~<: -:tj -..
7:Ta:, ; . ;; i .;..- : J-Jiaei 5 J>C '. iz 11 i. .
kMm 3< :our. iaack te 9e& pfewani Tcner*! ,aC . :ehttia Paam Faa* -'xaaat! an asset or a liability was "'th. '. | j _.. a b t to tours and groups. n*o leading 3-Star luxury hotels. incredible buy of the year. ^f Laromme hotels (mtx) UD. Program and Professional Activity Director, Library. Card Room, Auditorium and Theater, Sabbath Elevator. Beach. The Hotel telephone number is (305) 655-8800. | All rooms feature color TV., stereo & refrigerator"
Pricing available from other cities. Prices Based Upon Double Occupancy. between us and our many neighbors. exclusively for people 62 and over. or fill out and return the attached coupon. will begin again in January. the highest potential of fitness. '^f OF THE PALM BEACHES, INC.
trustees of the day school. as financial secretary last year. the Men's Club for two years. ship with the Women's Divj. ation of Palm Beach County. held Jan. 27 at The Breakers. I. Feinberg and Benjamin S.
to do is contact Jack M.
Beach, at 8 p.m., is also being sponsored by Midrasha. important performances in Uruguay, Brazil and Israel. the tickets are, adults $2.50, senior adults $2, students SI. For additional information please call 689-7700. Publix Bakerie* open at 8:00 A.M.
dering a job or career shift. become a Bat Mitz\ah on Jan.
II, 8 p.m.. at Temple Israel. Mincha followed by Sholosh Suedoa. "'W. Friday 8:15 p.m., Saturday 9 a.m.
Beach 33407. Phone 833-0339. Rabbi Howard J. Hirsch. Dardashti. Sabbath services, Friday 8:30 p.m.: Saturday 9a.m. Abraham Rose. 1-287-8833. Services Friday evenings 8 p.m.
1869. Friday night serivces 8:15 p.m.. Saturday. 9a.m. 13000 Paddock Dr.. Wait Palm Beach. Mauling address. Box 17008. West Palm Bench, FL 33406. Friday *****"
p.m. Rabbi Steven R. Westman. Phone 793-2700. 33407. Phone 833-8421. Rabbi Howard Shapiro, Can"""
Soloist Susan Weiss. Sabbath services. Friday 8 p.m.
5154 Okeechobee Blvd., West-Palm Bench. FL 33409. P"
fnd lunch at Casa Blanca. at the homes of "host"
lara Grand for more information. Inch at the Captain's Table on Saturday, March 2. (appy tella" at the Royal Palm Dinner Theatre. or information call Tessie DeMaia or Grace Paris. tmbers of the chapter serving as models. prn hall on Jan. 14 at 12:30 p.m.
mk will tell stories of Jewish folklore. [ail corner of Boynton Beach Road, on Wednesday, Jan.
Ibin, a noted humorist and poet. 15, 3 p.m., at the Clubhouse at Century Village. flitary Trail and Gun Club Road. I play accompanied on the piano by Jerry Feinberg. through 9 p.m. beginning Jan.
evening, Jan. 18 at 8:15 p.m.
served in Senter Hall at 6 p.m.
will be reviewed by Elsa Marx. held on Tuesday noon Jan. 22.
i Chapel. West Palm Beach. Temple Beth El, Boca Raton. with no moving parts. Prof.
team unveiled the "Etgar 3"
Service and the Joseph L.
B'rith chapter in that area. Argonne is one of the U.S.
the Jewish Federation of Palm Beech County. Announcing El Al's Sunsation Plus Vacation to Israel. Jerusalem or Tel Aviv, including breakfast. Laromme Hotel, or the Tel Aviv Hilton. available until February 28. 1985.